theodore M I R A L D I ... OpEd: VIOLENCE Occurs When People LOSE FAITH In THEMSELVES. VIOLENCE Occurs When People LOSE FAITH In THEMSELVES. There can be no doubt that the violence in Charlottesville is a grotesque symptom of much greater problem troubling this nation. This is what division does. It breads violence. Erasing American History to soothe the wants of Special Groups who probably weren't even born when many injustices occurred is to deny there was any good at all within people. Isn't that where prejudice resides in peoples hearts. Are we only a Multi-Cultural nation when the culture comes from outside of our borders. 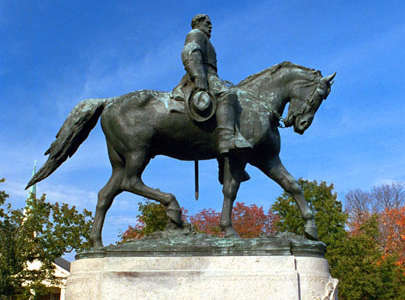 It is not Right or Just to condemn a symbol of History, regardless of your personal narrative. Judging others who lived decades before is a slippery slope when examining pathos alone. Pathos alone by by definition breeds contempt and anger. There are those who will now preach about Unity, the same charlatans that have beat the drums of Hate. These Forked Tongue Liars will get in front of a television microphone after a tragedy and continue to divide us through dissent. They will talk about Immigration, Gay Rights and a host of abnormal narratives that normal people feel strongly against. They will try to social engineer a landscape of hate and distrust among the citizens of this nation. And when people stand and voice their opinion, they are shouted down by the very people who preach democracy and their version of Free Speech. Make no mistake violence begets violence, and you reap what you sow. Our nation has seen the use of violence in many cities and communities throughout the nation. Let's be clear, it's the left that uses violence to placate the savages within our society who will not take no for an answer. Now this methodology seems likely for those who feel left behind, abused by government, media and their fellow citizens. If it works for them, it will work for us mentality. What is shameful and dishonest is to put the blame on innocent men and women who respect the sacrifices Historical Figures have made in the context of today. Like the Egyptians in less sophisticated times, are we still afraid of truth.